In June of 1776, Capt. George Heriot was the engineer in charge of building fortifications in Georgetown. On June 13, 1777, Marquis de Lafayette with Baron de Kalb landed on North Island near Georgetown and spent two days with Major Benjamin Huger. While there, Lafayette swore to conquer or die in the American cause. When Brigadier General Augustine Prevost threatened Charlestown in May of 1779, the treasury and the records of the Province were removed temporarily to Georgetown (May 12 to July 1). After the capture in July of 1780, Major James Wemyss attempted to raise a Loyalist militia within Georgetown, but he found few men worthy of leading a Loyalist cause in the surrounding area. Major Wemyss was against John Coming Ball as an officer because he was not respected by the people who lived north of the Santee River. He was, however, ready to offer a colonelcy to Theodore Gaillard. Major Wemyss's attempt was cut short by the advance into the northern portion of the Georgetown District of the Continental Army under Major General Horatio Gates and the North Carolina Militia under Major General Richard Caswell. Due to other needs by his superiors, Major Wemyss was ordered to leave Georgetown on August 8th, but he was too late to join Lt. General Charles, Lord Cornwallis's victory at Camden. Major James Moncrief of the engineers with the 7th Regiment of Foot (Royal Fusiliers) was then sent to Georgetown to construct new defenses and to support Col. James Cassells in his attempt to keep his Loyalist militia together. Major Moncrief placed Loyalist Col. John Comings Ball at Shepherd's Ferry over Black Mingo Creek and Col. Joseph Wigfall at Black River Church. Both of these Loyalists were authorized to establish militias south of the Santee River by Lt. Col. Nisbet Balfour, the new commander of Charlestown. Major Moncrief was then ordered to Camden on September 9th. In November of 1780, a Lt. Blake now commanded Georgetown. Lt. Col. Balfour wanted to reinforce Lt. Blake with Loyalist militia under Nicholas Lechmere and Robert Ballingall, but the local Charlestownians prevented men from signing up. On November 24th, Lt. Col. Balfour sent Lt. John Wilson, an engineer, with a galley and two cannons to Georgetown with orders to improve the redoubts to make them "absolutely impregnable." In mid-December of 1780, Lt. Col. Balfour recalled Lt. Blake to Charlestown and sent him to Camden. Lt. Col. Balfour replaced Lt. Blake's force in Georgetown with Edmund Fanning's King's American Regiment and John Saunders' Queen's Rangers - 230 trained Provincials fit for duty. Lt. Col. Balfour replaced Edmund Fanning with Lt. Col. George Campbell as commanding officer of Georgetown in late December of 1780. By May of 1781, the British had been reduced to about 100 troops occupying Georgetown, now commanded by Capt. Gray, which Lt. Col. Balfour ordered to return to Charlestown and leaving Georgetown wide open for Brigadier General Francis Marion to retake. On May 28, 1781, the British finally evacuated Georgetown on a galley, two gunboats, and an armed schooner, and the next day Brigadier General Francis Marion and his Patriots walked in. The British fleet did keep its eyes on Georgetown for some months to come, but they had little influence on day-to-day life any longer. On August 2, 1781, British Capt. Manson brought up his galley and bombarded Georgetown, setting fire to 42 homes. With Charlestown still tightly in British hands, Georgetown quickly became the primary port and center for supplying the State's Continental and Militia troops. Major General Nathanael Greene's army began to receive ammunition, arms, powder, bar iron, boots, military shoes, shirts, blankets, saddles, and foodstuffs from Georgetown. To regularize procurement, Major General Nathanael Greene appointed John Waties, Jr. as a special agent to purchase and forward such stores as his army needed. Supplies immediately needed were to be sent by wagons; goods kept on hand for future needs were to be stored in the neighborhood of Black Mingo Creek, a favorite haunt of Marion's men. In January of 1782, Major General Nathanael Greene appointed John Gough superintendent of a factory to make shoes, giving him authority to impress slaves to forward this business. In March of 1782, Major General Nathanael Greene sent Col. Christian Senf, a Hessian engineer, to fortify Georgetown. Col. Senf convinced many plantation owners to provide slaves and workers for several months - March to July. At the same time, Brigadier General Francis Marion appointed Col. Peter Horry as the new commandant of Georgetown, but Horry soon retired and turned over command to Capt. William Allston. Major Geeral. Greene sent him a company of artillery from Camden with 30 men and one howitzer. In June of 1782, Capt. William Allston was replaced by Lt. Col. John Baddeley of St. James Goose Creek. Lt. Col. Baddeley commanded Georgetown for about a month, when Lt. Col. Richard Lushington succeeded him. 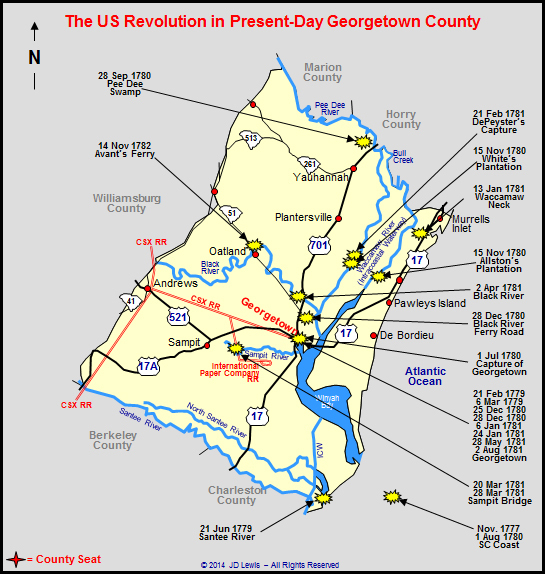 On July 31, 1782, British ships arrived at Georgetown but did not attack. They sent flat boats up river as far as Tidyman's Plantation and took a lot of rice. They left Georgetown by August 9th. There are no known records of any military activity in and around Georgetown after this final event.